Hi everyone! 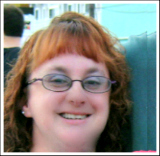 I am Jennifer, and I blog at Making Our Life Matter. I am so excited that Crystal let me take over one of her posts today. 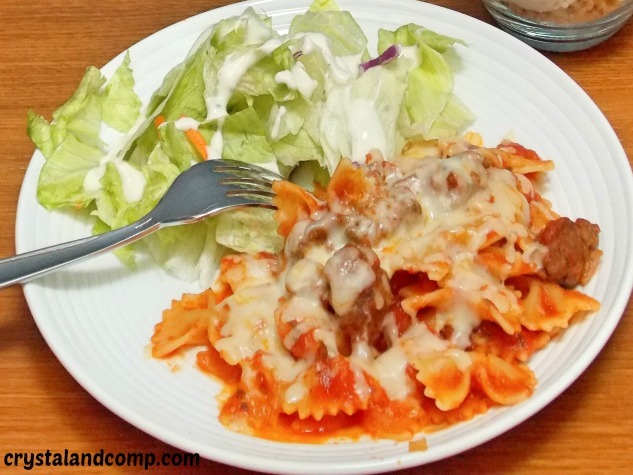 I am sharing one of my favorite easy meal ideas that will please the whole family. My lasagna-inspired casserole bake is an easy meal that you can have on the table in 45 minutes, and your entire family can help make it. 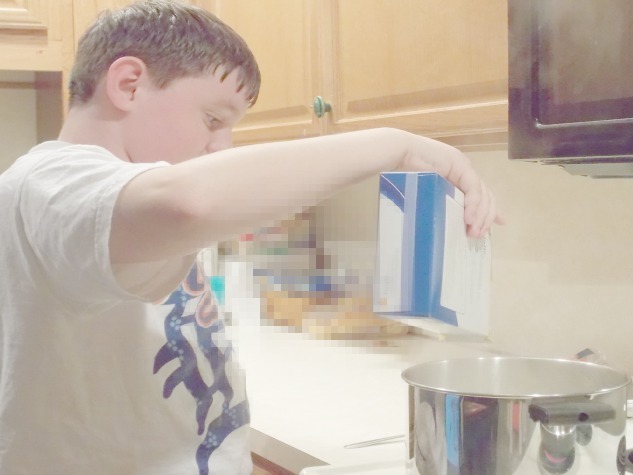 I am a full-time working Mom and an avid baseball Mom, so being home to cook a hot meal every night can be hard. I have two teenage boys that are starting to do more cooking, and enjoy starting the dinner preparation before I even get home from work. Now, all of my guys are big eaters, and they really love lasagna. But, as most of you know, it is a long process to make lasagna. In comes my recipe for the lasagna-inspired casserole bake. You get all the great tastes of lasagna, but in one-fifth the time! And kids love to help out, too! Ground meat of your choice. We generally use ground chicken, but most times I use whatever happens to be on sale. Chopped onions. Red onions give it the best flavor. Spaghetti sauce of your choice. Shredded mozzarella cheese. Whole milk variety works the best. Dash of pepper, onion salt, and garlic salt. Brown meat with the onion, and drain the fat. Set aside. Cook the bow-tie noodles, as directed. I generally cook them 2 minutes less because they will be in the oven. And this is my favorite part, as my kids love to make the noodles. Drain noodles as directed. Return them to the pot, and add the meat and spaghetti sauce. Stir gently. 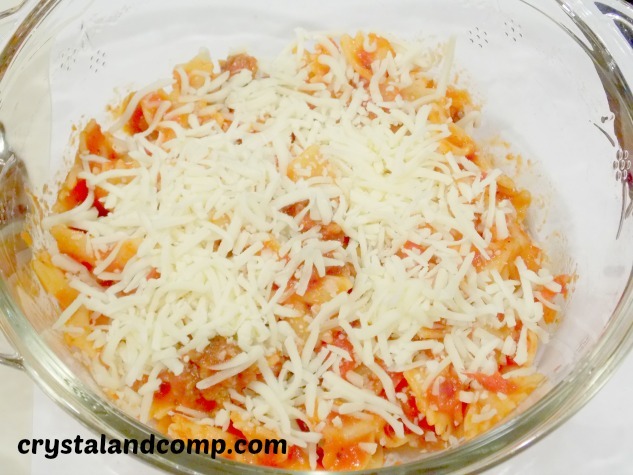 Layer the mixture and cheese in an oven-safe casserole dish. Bake in oven for 20 minutes, or until cheese is melted. You can serve it alone, or with a side salad. We use the bag salad to make it easy, and the kids can help get the salad fixings ready too! So there you have it! 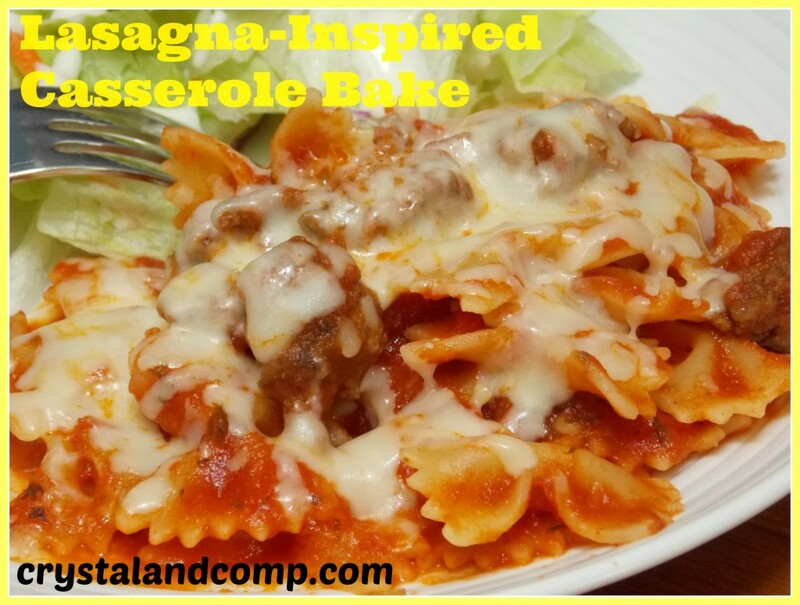 An easy lasagna-inspired casserole bake that can me made any day of the week. You get all the great taste of lasagna, but not all the time and work. 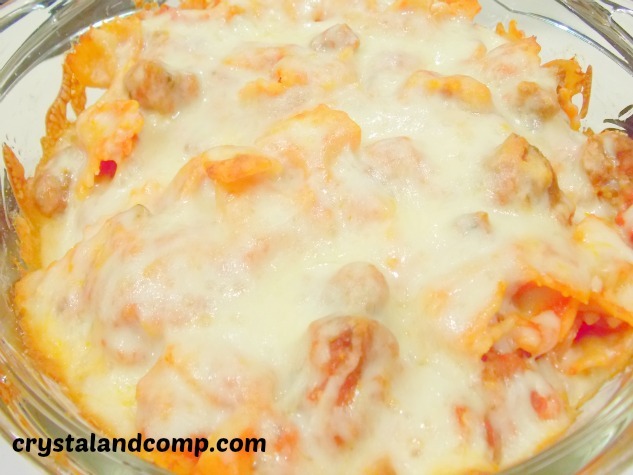 What would you serve with this lasagna-inspired casserole bake? Thanks Crystal, for letting me share my recipe with your readers! I am a wife, Mom, and wrangler of 2 four-legged family members. My family and I live in East Central PA and I love coffee(especially iced coffee), reading, and spending time with the family. Working FT as a bookseller fuels my reading addiction, and pays for my coffee obsession. A Philadelphia sports fanatic, baseball Mom, aspiring beach bum and lover of sunshine. Thanks for letting me guest post and share my recipe! Hope everyone finds it as easy and delicious as I intended it to be! This looks so yummy that I can not wait to try it out. For me I would serve it with some French Bread. Great idea about the French bread. Yum!! I do something very similar because lasagna, though yummy, is very time consuming. I add ricotta cheese to it though. Thanks for linking up to the Bloggers Brags Pinterest Party. I have pinned your post to the Bloggers Brags Pinterest Board. My guys aren’t fond of ricotta. I would love it because I do. mmmm…Yum! I think we are going to have to try this soon! Thanks for linking up at the Thoughtful Spot Weekly Blog Hop! We hope you stop by again next week! Let me know if you make it, I would love to hear what you and your family think! This looks so yummy and way easier than lasagna! It is much easier, and just as tasty! Jennifer’s Casserole looks amazing, Crystal! Thank you so much for sharing this awesome post with Full Plate Thursday and hope you are having a fantastic weekend! Thank you for the nice comment Miz Helen. It is a family favorite.